At the ICC 2018 code hearings in April, two sets of code changes were approved by the committee and if the ICC members approve the changes in October, they will be part of the 2018 code. These changes would give builders greater flexibility in meeting the International Residential Code (IRC) and International Energy Conservation Code (IECC) in the areas of unvented attics and buried ducts. It’s worth noting that these measures received near unanimous support of IRC and IECC committees and no challenges from the assembly. If final approval is issued, these changes would allow the code to catch up to building practices that have proven successful in the field and under DOE’s Building America program. This article is the second of a two-part series. 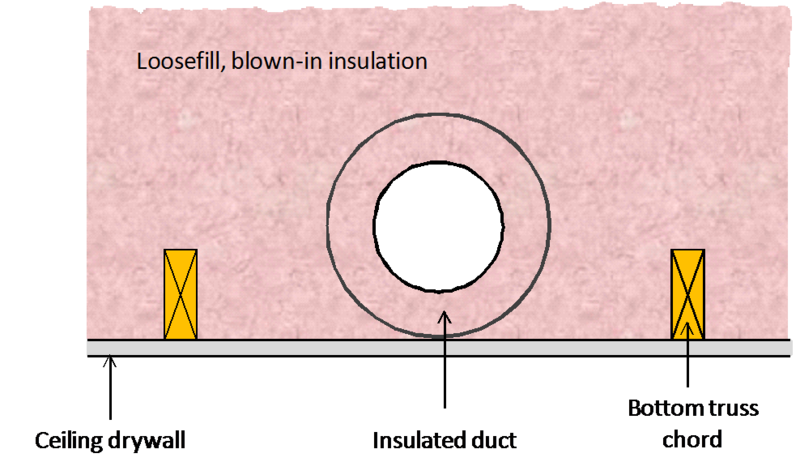 Part one provided an overview of the proposed change that would allow builders to use air permeable insulation for unvented attics. This article will focus on the proposed options for buried ducts in a vented attic. The growing focus on the energy performance of a home and reducing energy usage has builders looking for ways to improve whole home performance which includes higher performing duct systems. Duct location can vary (conditioned versus unconditioned spaces) and may be based on regional and builder practice. 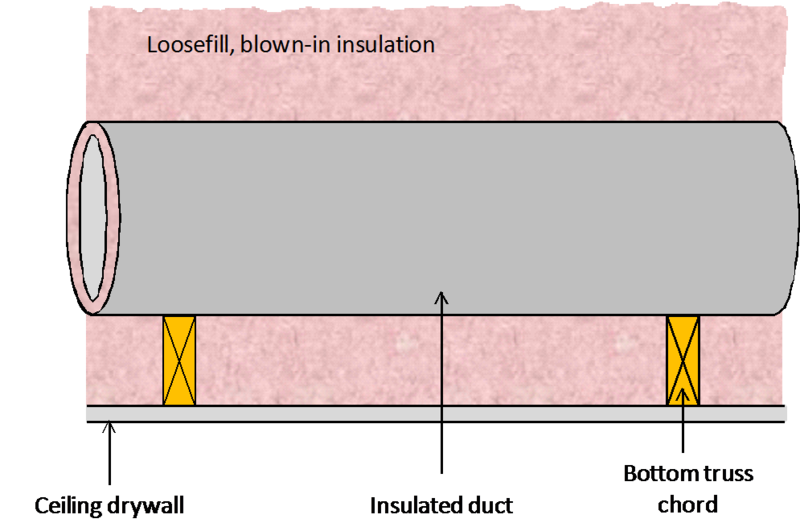 The focus here will be conduction losses specific to ducts in the attic and limiting their part of the overall energy use of a house. Under-insulated and leaky ducts in the unconditioned attic space results in reduced energy efficiency of the home. The air flowing through these ducts will be cooler than the home in the summer and warmer in the winter leading to high conduction loses. Conditioned air leaking from the ducts is lost to the unconditioned attic space and carries more energy than an equivalent amount of interior home air. Code requirements for vented attics have moved to increased R-value and reduced duct leakage. While some builders have moved ducts into the conditioned space, that change can be labor and material intensive, may require changes to plans, and can have aesthetic implications. Buried ducts provide an opportunity to preserve the current practice of installing ducts in the unconditioned attics and creating higher performing duct systems by reducing energy loss from the ducts and potentially providing a net neutral cost to install. Buried ducts as a building practice have been tested in Building America and California Energy Commission research programs. There were a total of three proposals on buried ducts, all from NAHB. The first of the code proposals describes details for burying ducts by climate zone, notably requiring R-13 ducts in climate zones 1A, 2A, and 3A and R-8 ducts elsewhere (noting vapor retarder requirements for insulated ducts in Section 604.1.1 of the IMC), while also including requirements for ceiling insulation burying levels. These requirements take into consideration control of the dew point at the duct condensation plane. Additional proposed code language allows the builder to receive added thermal performance credit via an effective R-value from the additional insulation around the ducts. Taking it one step further, another aspect of the proposed code changes would enable the builder to claim credit for ducts as though they were in the conditioned space, provided they are buried to the extent described in the language with additional criteria around air handler location (within the conditioned space) and reduced duct leakage to the stated value. Schematic representations of a buried duct against the ceiling drywall (1) and across the bottom truss chord (2) are shown below. Previously, the approach to burying ducts in the humid climates involved encapsulating the ducts in a layer of spray polyurethane foam (SPF) before burying beneath the ceiling insulation. The 2018 Residential Energy Conservation Code committee action hearings have given builders more cost effective options to drive energy savings while enabling builders to achieve high performance levels and compliance credit for the duct system. Buried ducts being recognized within the code provides an opportunity for manufacturers to partner with the industry to drive high performance building practices. Additional code actions are possible before the 2018 IECC is approved, but there is an expectation that buried ducts as an option will be available in the final version. This, in addition to unvented attics discussed in part one, results in more choices for the builder to meet the need for cost-effective duct and attic systems.